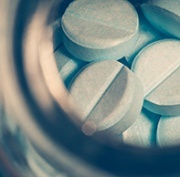 Opioids are not superior to nonopioids for the treatment of moderate-to-severe chronic back pain or hip or knee osteoarthritis pain, according to a study published recently in JAMA. The study showed no significant difference in pain-related function for patients treated with opioids versus nonopioids, although pain intensity scores were better in nonopioid-treated patients. Additionally, adverse medication-related symptoms were significantly more common in patients treated with opioids. The pragmatic, 12-month, randomised trial recruited patients with moderate-to-severe chronic back pain or hip or knee osteoarthritis pain that persisted despite analgesic use. The 240 patients, with a mean age of 58.3 years and a gender distribution of 13% women, were recruited from 62 Veterans Affairs primary care clinics located in Minneapolis in the USA. Patients were randomised to one of two treatment regimens, each with a range of medication options, given in a series of three steps. For the opioid group, this involved immediate-release morphine, oxycodone or hydrocodone/paracetamol; followed by sustained-action morphine or oxycodone; and finally transdermal fentanyl. The nonopioid group were first given paracetamol or an NSAID; followed by topical analgesics or adjuvant oral medications such as nortriptyline, amitriptyline or gabapentin; and finally pregabalin, duloxetine or tramadol. Medications were changed, added or adjusted primarily by a single pharmacist, according to patient response, in a treat-to-target approach. The authors monitored pain-related function over 12 months using the Brief Pain Inventory (BPI) interference scale; and pain intensity using the BPI severity scale, with a one-point improvement considered clinically important. Speaking with Pain Management Today, Professor Rachelle Buchbinder, Director of the Monash Department of Clinical Epidemiology at the Cabrini Institute in Melbourne, said ‘this trial indicates that for this population, opioids were ineffective’. ‘As the harms appear to outweigh any benefits this supports not offering opioids to these patient groups,’ said Professor Buchbinder. The authors concluded that ‘opioids did not demonstrate any advantage over nonopioid medications that could potentially outweigh their greater risk of harms’.